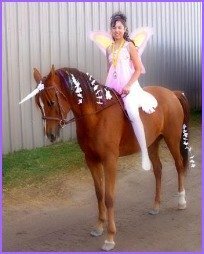 Here you'll find more than 30 awesome horse halloween costumes created by horsecrazy girls - with details on how you can make them yourself! Check out these awesome horses and costumes! Click on any thumbnail picture to see the full pic of the costume and how to make it. Yabba Dabba Do! Trick or Treat! Yes.... I am a Clydesdale !!! I think I need a bigger boat! I made this with foam pumpkins, glitter, fabric and lots of hot glue. It cost $150 and I wore it for a Halloween fun ride. My horse was amazing. A few years ago my horse dressed up as a John Deere Tractor for our county fair. Nothing runs like a Deere! Pool Party, Here We Come! Agnus, Edith, and The Fluffy Unicorn! Be safe girls! A horse can spook if your costume is flowing, or noisy, or has unusual smells or textures. * Give your horse a chance to sniff and see every piece of your costume before you mount your horse. * Use only safe materials - glitter, glue, dyes or paints should be non-toxic. You don’t want to give your horse (or you) an allergic reaction! * Always wear your helmet when you are on your horse. If you’re worried it won’t look good with your costume, consider a helmet cover. Better safe than sorry!